Syncreate Waypoints Creative Process Retreat, December 9, 2018, Austin, Texas. 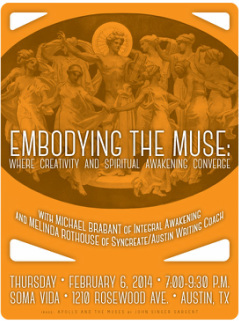 Chaos, Stillness, and Creativity, a presentation by Melinda Rothouse. ​Jung Society of Austin, Friday, June 22nd, 2018 at 7:00 p.m.
Tuesday, May 2nd, 2017, Noon - 1:00 p.m.
Thursday, February 9th, 2017, 12:30-1:30 p.m. Entrepreneurship is essentially a journey of creativity, requiring the generation of innovative products and services to solve real-world problems. Creative innovation requires both divergent (non-linear, so called “right brain”) and convergent (linear, “left brain”) thinking, integrating different neural pathways to imagine and envision solutions and put them into action. This dynamic, hands-on workshop will demonstrate how to move between the two types of thinking with agility and clarity. Each participant will have the opportunity to focus on a specific entrepreneurial challenge or project to arrive at a better understanding of their own creative process and productivity. The Creative Mornings Summit brought together Creative Mornings organizers from all over the world to share ideas and learn from on another. We were honored to be selected as presenters for the 2016 Summit, and we had a wonderful time meeting and working with creatives from this worldwide community. Miksang, or “good eye” in Tibetan, is a process of learning to synchronize mind and body, allowing one to open to the world without labeling or evaluating. Please join us for a relaxing and fun-filled weekend workshop for photographers of all skill levels, from beginners to professionals. Explore what happens when we begin to see our world directly, openly, as it offers itself to us. Through talks, discussion, assignments and reviews, and photo explorations, we deepen in presence and appreciation. No previous photographic experience is necessary - All you need is a digital camera, a water bottle and some sunscreen! Saturday and Sunday, August 1-2, 2015, 9:00 a.m to 6:00 p.m.
November 18, 2014, 6:00 p.m. In business, success requires the ability to connect and resonate with colleagues, employees, vendors, and clients. The path to authentic connection begins with sharing our ideas and experiences, yet many struggle with the level of vulnerability needed for true connection, which can often be perceived as weakness in the professional context. We suggest that appropriate vulnerability can actually establish credibility and create opportunities for collaborative thinking and connection, as well as foster professional growth. At the root of a good story is the power of empathy – the ability to create emotional connections that resonate between individuals and across the human experience. Not only do vulnerability and storytelling create connection, they can also transform individuals, relationships, and organizations. Join us for an evening of exploring and expanding how you're telling your professional story. 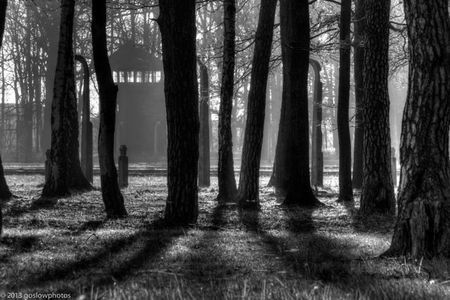 Friday, September 5, 2014, 7:00 p.m.
Join Melinda Rothouse and Jake Lorfing in a visual and spoken exploration of the Holocaust and the practice of bearing witness, based on their recent trip to Holocaust sites in the Czech Republic and Poland. The evening will include discussion of mass trauma, the potential for healing through art and creativity, and how these wounds continue to manifest in today's aggressive world. What can we do to become peace makers? August 14, 2014, 6-8 p.m.
﻿In this evening workshop, we will explore personal mythology and the power of story to enliven and inform our spiritual and creative lives, as well as the healing power of personal narrative in the journey to wholeness. Join Syncreate Co-Founders Charlotte Gullick and Melinda Rothouse for an intimate, interactive, joyful weekend of embracing your creative life. Be prepared to unplug from technology, embrace not knowing, and delight in collaboration. This retreat is open to anyone interested in exploring, re-igniting, or deepening their creativity; no specific experience, training, or expertise needed. At Syncreate, we believe in the power of creativity to evoke transformation; this is one of our major interests and areas of focus. Our events encourage transformation by offering an understanding of the psychology and neuroscience of creativity, experiential exercises to facilitate the creative process, a community of like-minded people interested in exploring creativity together, and concrete tools for bringing more creativity into your professional life, your artistic endeavors, and your world. Retreat activities will include creative visioning, ritual, meditation, movement, writing, and group meals, all set in a natural retreat setting on upper Lake Travis. Click here to see some photos of the retreat location. 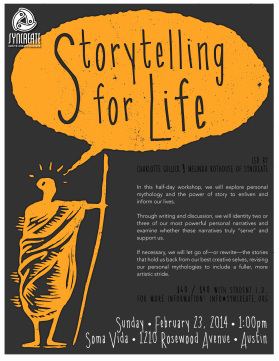 In this half-day workshop, we will explore personal mythology and the power of story to enliven and inform our professional, creative, and personal lives. All are welcome – no specific writing or storytelling experience necessary. Through writing and discussion, we will identify two or three of our most powerful personal narratives and examine whether these narratives truly “serve” and support us. If necessary, we will let go of or rewrite the stories that hold us back from our best creative selves, revising our personal mythologies to include a fuller, more artistic stride. Creativity is not just for artists; it’s something we all need to be successful in our relationships, livelihood, and soulful expression in life. In this intimate and inclusive workshop, we will cultivate and embody creativity through somatic movements, contemplation, and relational spiritual practices to feel inspired, physically energized, and able to move with more agility in our increasingly complex lives. 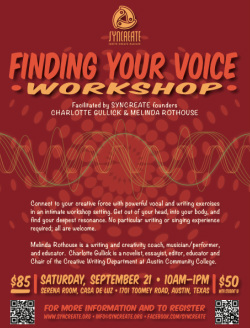 Thursday, February 6, 2014, 7:00-9:30 p.m.
Connect to your creative force with powerful vocal and writing exercises in an intimate workshop setting. Get out of your head, into your body, and find your deepest resonance. This workshop is open to educators, professionals, artists, and anyone interested in exploring their creativity and artistic expression. No particular writing or singing experience required; all are welcome. Saturday, September 21, 2013. 10:00 am – 1:00 pm. Open to anyone interested in bringing more creativity into education, work, leadership, art-making, or everyday life. 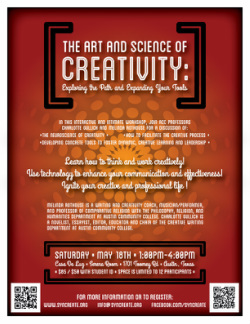 Learn how to think and work creatively, use technology to enhance your communication and effectiveness, and ignite your creative and professional life. Topics include: the neuroscience of creativity, how to facilitate the creative process, and concrete tools to foster dynamic, creative learning and leadership. Saturday, May 18, 2013, 1:00 – 4:00 p.m.